Backed by a highly trained and experienced team, Horizon possesses the engineering strength and technology to construct safe, durable and unique yachts that meet our clients’ most demanding requirements. Flexibility in design and construction is one of the distinctive features that distinguishes Horizon from other yacht builders and allows for each yacht to be customized to suit the individual owner’s lifestyle. This level of customization would not be possible without the talents of Horizon’s dedicated team of highly skilled yacht building experts, each of whom is qualified and specialized in his field. Backed by this experienced team, Horizon constructs safe, durable and unique yachts that meet our clients’ most demanding requirements. To date, Horizon has delivered over 780 yachts – more than 190 of these vessels are over 80 feet (24M) in length – and no two of these Horizon yachts are exactly alike. Each reflects its owner’s lifestyle and personality and is created with the care and dedication only achievable by a team of experts who are committed to customer satisfaction and long-term industry success. Horizon builds each yacht to International Standards and is fully certified by the world’s leading classification societies, including DNV, BR, LR and ABS. Horizon is approved to build to Flag Code with MCA (Lloyd’s Register 3), USL (Uniform Shipping Laws), NK (Nippon Kaij Kyokai) and CNS (China National Standard) and adopts SOLAS, MARPOL, CORLEG and MLC construction standards. 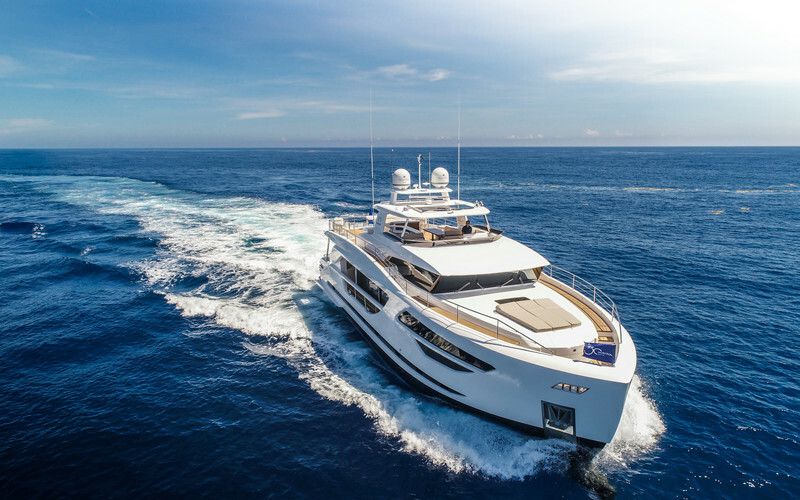 As members of the Super Yacht Builder’s Association (SYBAss) and the International Marine Organization (IMO), Horizon stays abreast of building trends and industry regulations. Having delivered over 780 motoryachts, Horizon places great importance on the efficiency and hydrodynamic capabilities of every build. With a solid background in Fast Patrol and Navy ship design, the Horizon R&D team excels at producing full-displacement hulls; semi-displacement with or without bulbous bows; and semi-planing, fully-planing and high-performance racing hulls. Horizon uses both the traditional Tank Test simulation and the computational fluid dynamic (CFD) analysis technique for all vessels to assure the maximum efficiency of each hull design. In 2017, Horizon debuted a new bow design to be incorporated on the FD85 and FD87 skyline models. The new “High Performance Piercing Bow” (HPPB), saw across-the-board hydrodynamic improvements in both tank and CFD testing during the design stage. While alternative bow designs that feature protrusions work more efficiently at either high or slower speeds, the HPPB brings both efficiency at slower speeds and performance at higher speeds.